Right: Thanks to Comrade Stalin, by D. Grinets (1937) / From Art and Power: Under the Dictators, 1930-1945, by Dawn Ades et.al. 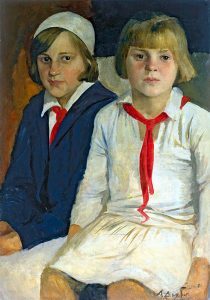 Children of the 1930s could rightly be called the first Soviet generation, whose formative years passed under the socialist system. The generation showed all the virtues and vices of the society it hailed from, and suffered all its ups and downs. 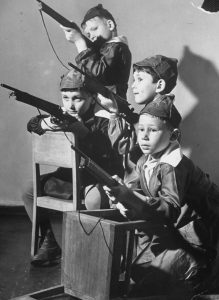 Young volunteers brought industry to the vastness of Siberia and collectivized the countryside, often at the point of a gun. They were the most educated generation of Russians ever, the most literate, perhaps the most militant as well. 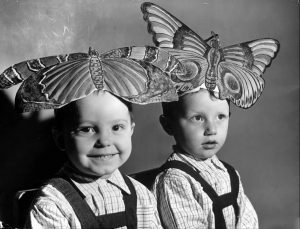 The generation of the 1930s felt itself healthier than any before, immune to the psychoses and depravities that capitalist inequity had once produced. Togetherness and discipline did not mark for them a lack of individuality, it signified a healthy sense of self based in community. This generation of great sins was also a generation of great accomplishments. It built the industrial city of Magnitogorsk in the open lands of the Urals, and would later overcome terrific hardship to defeat Hitler in the Great Patriotic War. Burdened with parents too old to be trusted by the party, these children sometimes suffered when their parents suffered. 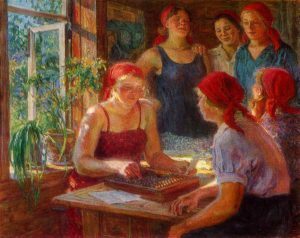 Yet if the Bolsheviks doubted or even wrote off vast sectors of the population – older people, women, peasants – as beyond the light of socialist reason, children were always thought malleable and saveable. Young people were provided educational and recreational opportunities that improved their lives and forged their socialist consciousness, and many responding with unquestioning loyalty to party, state and leader. They remembered a decade of peace and contentedness, later shattered by a foreign invader. 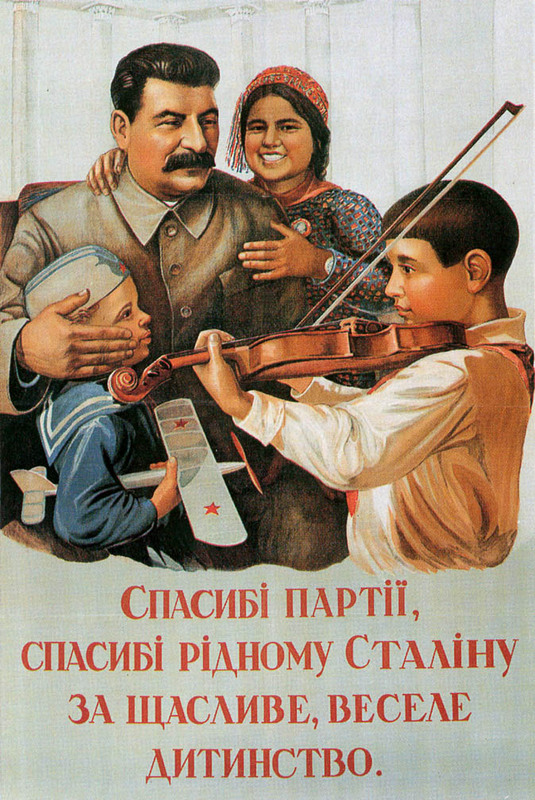 The slogan “Thanks to Comrade Stalin for our happy childhood” rang without irony for children who were cared for, believed in the society that cared for them, and accepted its structures of authority. 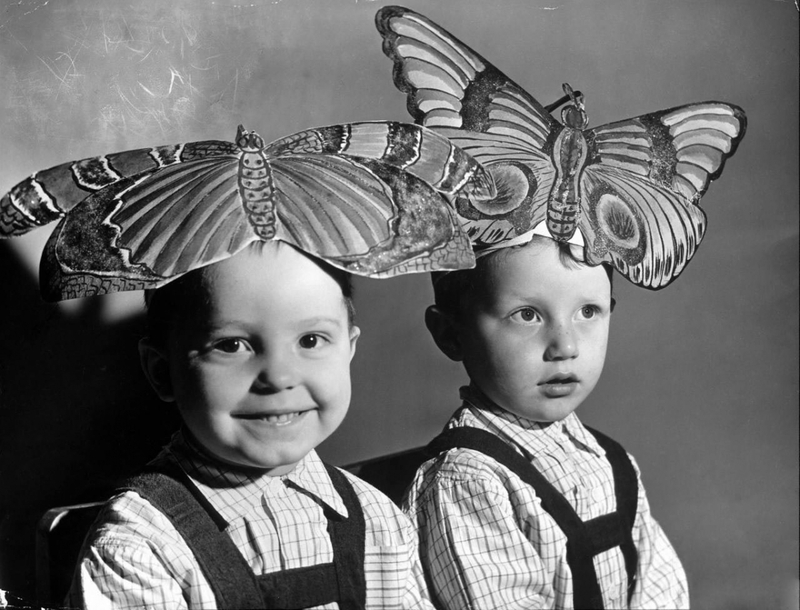 Even in these grim times children managed to preserve their sense of fun, and to find places to hide from the watchful eye of their elders. The standards of their guardians were rigorous, but they were also difficult to enforce. Grim though they could seem in theory, many a classroom or orphanage was in practice a Tom Sawyer paradise. On December 5, 1936 in connection with the proclamation of the new “Stalin” Constitution, the Kazakh and Kirghiz ASSRs were elevated in status to fully-fledged union republics. With the simultaneous sub-division of the Transcaucasian Federation into the three union republics of Armenia, Azerbaijan, and Georgia, this brought the total number of union republics to eleven. These administrative changes along ethno-territorial lines represented the fruits of the Soviet nationality policy of korenizatsiia, and specifically, the training of a sufficient number of indigenous cadres to reliably promote the party’s line of “national in form, socialist in content.” Many indices pointed in the direction of cultural modernization. Literacy rates rose dramatically. For example, in Tajikistan the proportion of literate people between the ages of nine and 49 increased from just four percent in 1926 to nearly 83 percent by the end of the 1930s. 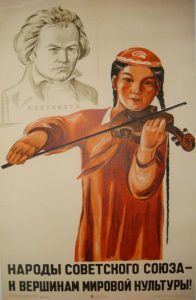 Each of the republics nationalized long-dead writers, dispatched singing and dancing ensembles to tour the USSR, and otherwise exhibited the trappings of national cultures. But not all was well in Central Asia. 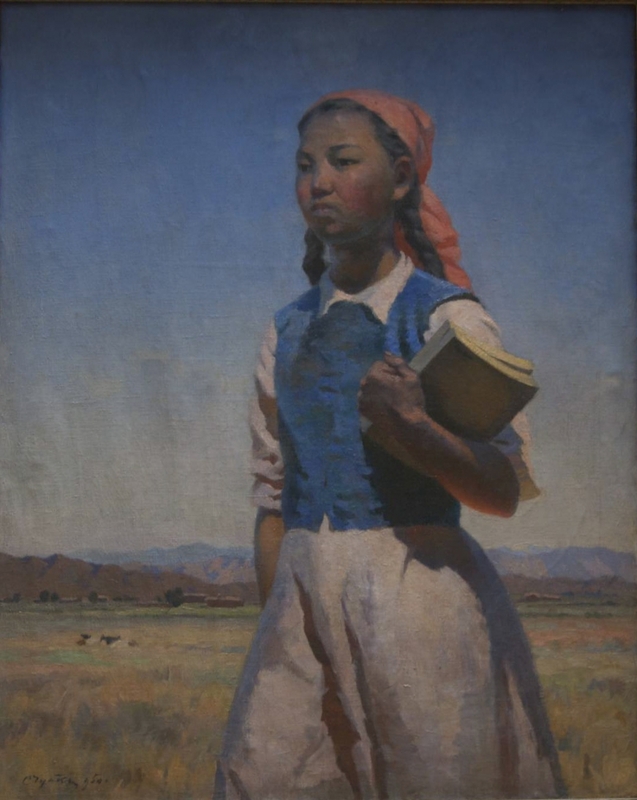 Collectivization had had a particularly devastating effect in Kazakhstan where flocks of sheep and goats, lacking fodder, suffered huge losses, and the predominantly pastoral Kazakhs faced either starvation or flight across the Chinese border. Little wonder that their numbers showed a decline of 20 percent between the censuses of 1926 and 1939. Elsewhere, the expansion of cotton cultivation was often at the expense of food crops and human consumption. The crackdown on religious practices that had begun in the late 1920s continued, and thousands of Muslim clerics fled to Afghanistan and Iran, accompanied by their families and disciples. Politically, though the situation in Central Asia seemed stable in 1936. In Uzbekistan, power was shared between Faizulla Khodzhaev (1898-1938), a native of Bukhara and a former Jadadist who served as Chairman of the Uzbek Council of People’s Commissars, and the First Secretary of the Uzbek party organization, Akmal Ikramov (1898-1938). But stability — particularly when it involved employing the nomenklatura system to strengthen clan ties — was anathema to Stalin. Both Khodzhaev and Ikramov were removed from office in 1937, and wound up in 1938 as defendants in the last major show trial of the Great Purges. Tens of thousands of other party and state officials throughout Uzbekistan and the other Central Asian republics were also victims of the purges, which opened up opportunities for a new crop of Communists to assume office and favor their fellow clan members. On May 26, 1936 the draft of a law “On the Protection of Motherhood and Childhood” was published in Soviet newspapers with an appeal for public discussion of its contents. The draft included measures aimed at “combating light-minded attitudes towards the family and family obligations,” tightening restrictions on divorce, and increasing the prestige of mothers of many children. Expressing trends in official attitudes towards these issues that reflected a major shift from the more liberal marriage law of 1926 (which itself had replaced even more radical legislation dating from the early 1920s), these measures attracted relatively little controversy. 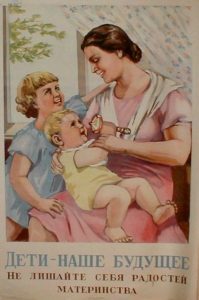 But despite the announcement in the draft that the network of maternity homes and childcare facilities would be enlarged several fold, the range of opinion concerning the prohibition of abortion and the forcefulness with which such opinions were expressed in letters published by the press was quite extraordinary. Right: To Mother for the Next Feeding, by T.G. 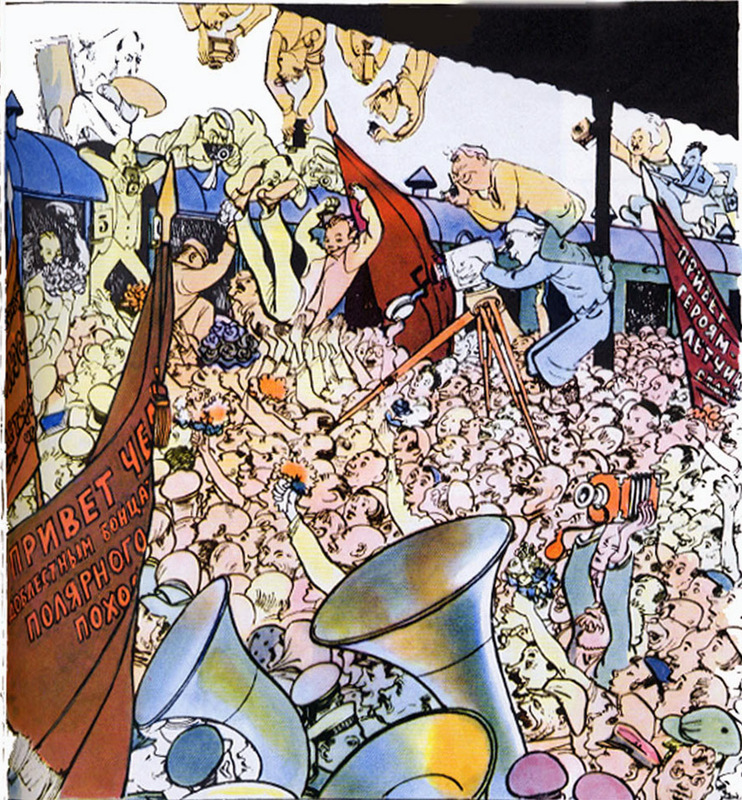 Gaponenko (1935) / From Art and Power: Europe under the Dictators, 1930-1945, by Dawn Ades et.al. The previously existing law “on the Legalization of Abortions” dated from November 1920. 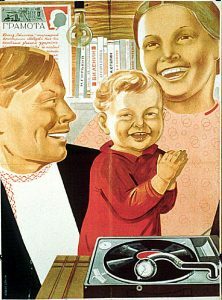 While referring to abortion as an “evil” and calling for propaganda to combat it, the law asserted that to protect the health of women abortions would be performed “freely and without any charge in Soviet hospitals.” By the mid-1930s, official concerns about a declining birth rate as well as the aim to strengthen the family unit as a bulwark of social stability doomed the old law. 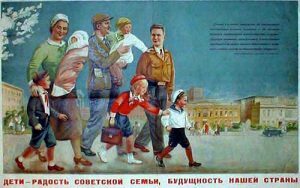 To Stalin, giving birth was “a great and honorable duty” which was “not a private affair but one of great social importance.” Henceforth, Soviet women would carry the double burden of holding a job in the wage-labor force and working in the home raising children. 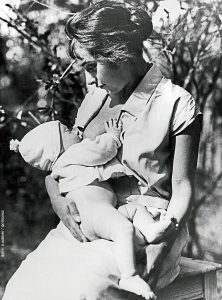 The draft decree proclaimed that “only under conditions of socialism, where … woman is an equal member of society … is it possible seriously to organize the struggle against abortions by prohibitive laws as well as by other means.” It permitted abortions only in cases when the continuation of pregnancy threatened the life of the pregnant woman. Opposition to the proposed legislation came from many quarters but was particularly prominent among young urban women. Their objections typically were not based on a woman’s right to control her body but rather on the impossible strains that bearing and raising children would impose on their pursuit of a career, on available living space, and other quotidian concerns. 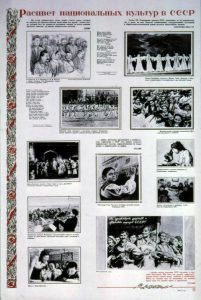 Except for minor changes, however, the draft was approved by the Central Executive Committee and the Council of People’s Commissars and went into effect on June 27, 1936. The number of officially recorded abortions dropped sharply from 1.9 million in 1935 to 570,000 in 1937, but thereafter began to climb, reaching 755,000 in 1939. Despite criminal liability for performing illegal abortions, the actual number was probably a good deal higher. 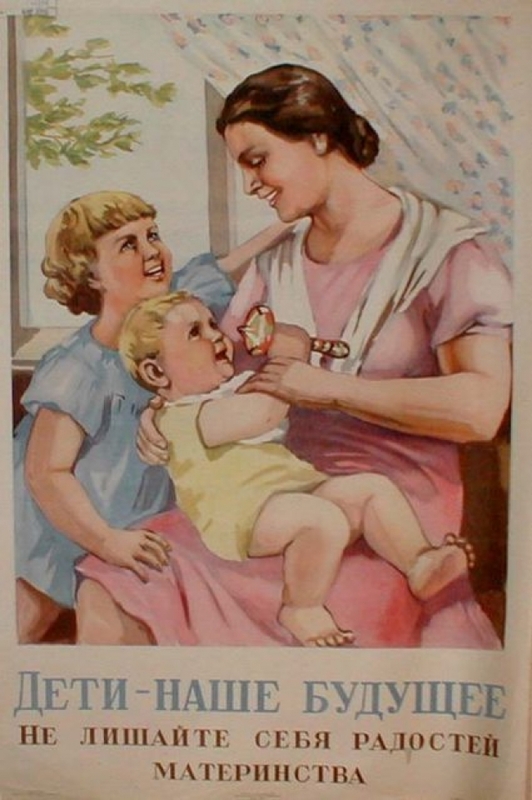 It is also worth noting that according to the People’s Commissar of Health, the rate of infant mortality rose from 146 per thousand newborns in 1935 to 162 in 1938. 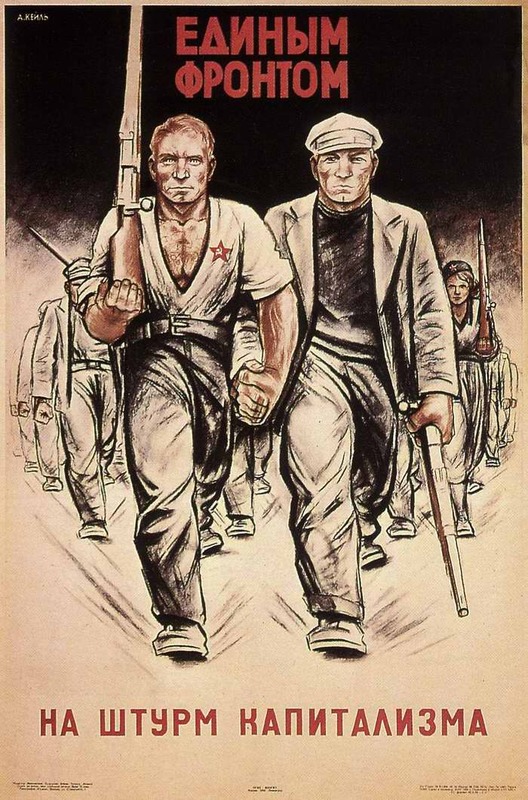 The Great Terror, a retrospective term which historians have borrowed from the French Revolution, refers to the paroxysm of state-organized bloodshed that overwhelmed the Communist Party and Soviet society during the years 1936-38. Also known as the Great Purges or Ezhovshchina (after the People’s Commissar of Internal Affairs, Nikolai Ezhov, who oversaw the process before himself becoming one of its casualties), it has been a major subject of debate concerning its origins, extent, and consequences. Recent archival-based research has resolved some issues, but there remains much that is elusive about the Terror. 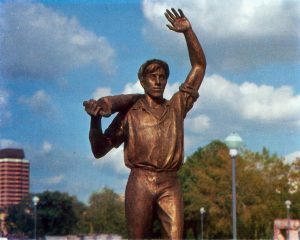 For the sake of clarity, it is worth noting that the Soviet government did not describe the arrests and executions of party and state personnel as terror but rather as part of its response to alleged terrorist plots and actions. The Great Terror was punctuated by three elaborately staged show trials of former high-ranking Communists. In July-August 1936 Lev Kamenev, Grigorii Zinoviev, and fourteen others were convicted of having organized a Trotskyite-Zinovievite terrorist center that allegedly had been formed in 1932 and was held responsible for the assassination of Sergei Kirov in December 1934. 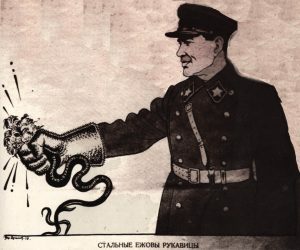 Still dissatisfied with the efforts of the police to investigate and liquidate such nefarious plots, Stalin replaced Genrikh Iagoda with Ezhov as head of the NKVD in September 1936. A second show trial followed in January 1937 with Iurii Piatakov and other leading figures in the industrialization drive as the chief defendants. At a plenary session of the party’s Central Committee in February-March 1937, Nikolai Bukharin and Aleksei Rykov, the most prominent party members associated with the so-called Rightist deviation of the late 1920s and early 1930s, were accused of having collaborated with the Trotskyite-Zinovievite terrorists as well as with foreign intelligence agencies. 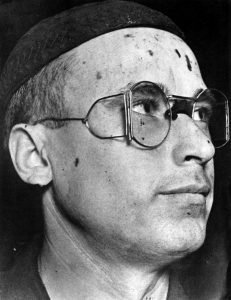 They along with Iagoda and others eventually were tried, convicted, and sentenced to death in March 1938. Between the second and third show trials, the upper echelons of the Red Army were decimated by arrests and summary executions, and the same fate befell provincial party secretaries, party and state personnel among the national minorities, industrial managers, and other officials. The process fed upon itself, as the accused under severe physical and psychological pressure from their interrogators, named names and confessed to outlandish crimes. 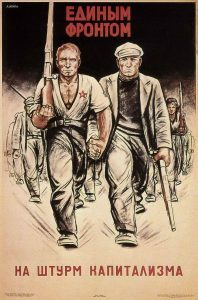 Millions of others became involved in the frenzied search for “enemies of the people.” In addition, the Politbiuro ordered Ezhov on July 3, 1937 to conduct “mass operations” to round up recidivist criminals, ex-kulaks, and other “anti-Soviet elements” who were prosecuted by three-person tribunals. 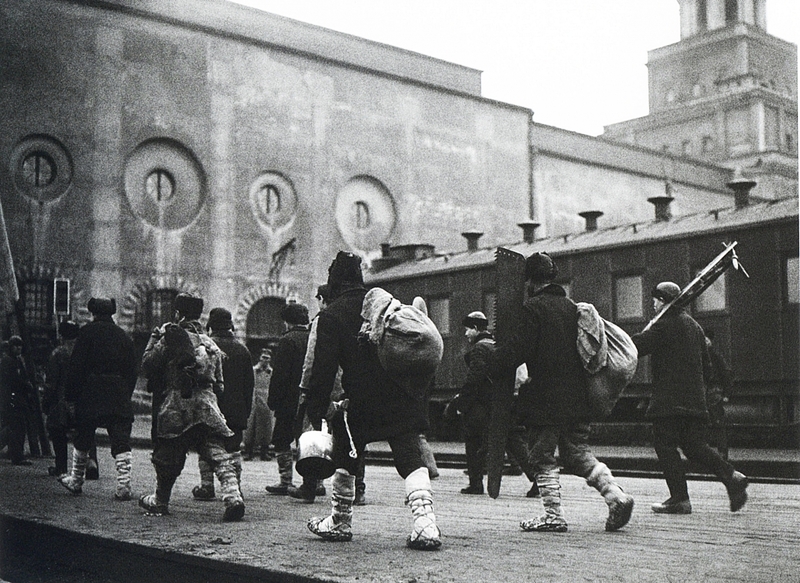 Ezhov actually established quotas in each district for the number of arrests. His projected totals of 177,500 exiled and 72,950 executed were eventually exceeded. What had begun as bloody retribution against the defeated political opposition developed as a self-induced pathology within the body politic. Its psychic consequences among the survivors were long-lasting and incalculable. Polar exploration was revolutionized by the advent of long-distance high-altitude aviation. The first polar flights were led by Richard Byrd and Roald Amundsen in 1926, followed up by the first flight across the Arctic Ocean in 1928 by George Hubert Wilkins and Carl Ben Eielson. 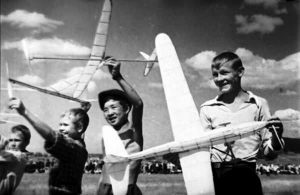 At this point the Soviet Union, with its growing tradition of aviation innovation, a generation of world-class pilots, and the ability to marshal tremendous resources in pursuit of a single goal, entered the field and gained glory throughout the world for its polar exploits. Soviet pilots were involved in 1928 in the heroic rescue of a dirigible expedition led by the Italian Umberto Nobile, which crashed on the ice north-northeast of Spitsbergen (Norway), killing seventeen crew members and leaving seven stranded on the ice. 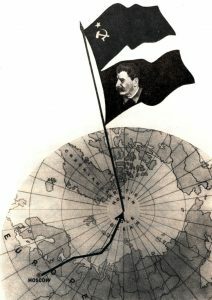 Polar exploration was the darling of the western press, which chronicle the races of adventurers who sought to become the first to reach the North or South Poles, Soviet expeditions typically sought to establish viable communities in the polar regions, and to create conditions for long-term scientific investigation. 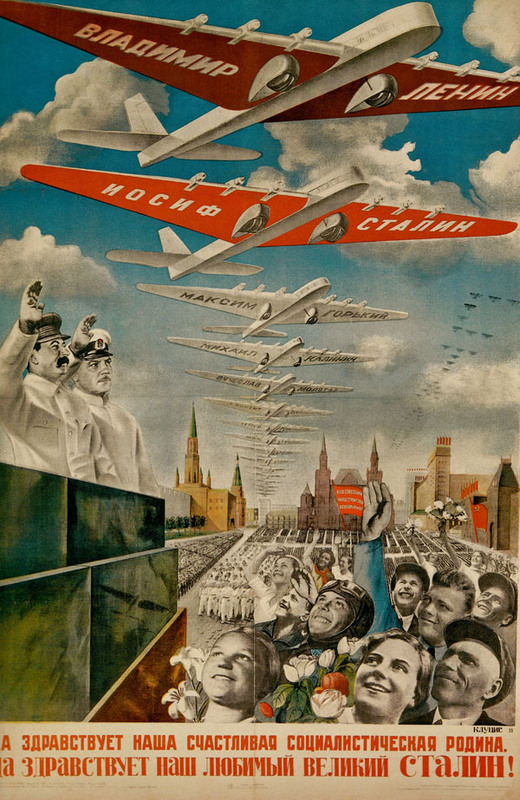 Still, Soviet readers who thirsted for adventure had the exploits of the pilots to follow. Scientists, mariners and aviators collaborated on the great expedition of the icebreaker Cheliuskin in 1934, led by Otto Schmidt, professor of mathematics at Moscow State University who would lead several highly-publicized expeditions to the Pole in the next few years. The expedition made great strides in the study of life under polar conditions, and charted new territory; it came during an end in the harsh winter months, when ice crushed the hull of the ship and stranded the crew on the ice. When weather permitted, aviators were able fly in and rescue the party intact, women and children (including one born during the expedition) first. They were feted throughout the Soviet Union during the long route home. 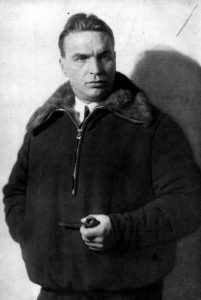 A second expedition no less chronicled in the press took place in 1937, when pilot Mikhail Vodopianov deposited a party led by Ivan Papanin near the pole, founding the first Soviet drifting station, North Pole I. In toto, these expeditions proved, according to none other than Joseph Stalin, that scientific progress would inexorably improve human life. 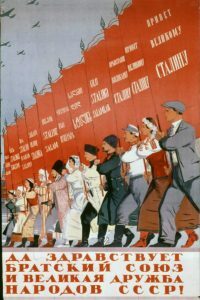 The 1930s were a decade of both danger and opportunity for the Soviet Union as well as the international Communist movement represented by the Comintern. Even before the onset of the Great Depression, the Comintern had predicted a general crisis of capitalism and adopted a militant strategy that renounced coalitions with other working-class based parties or trade unions in favor of preparation for the inevitable proletarian revolution. 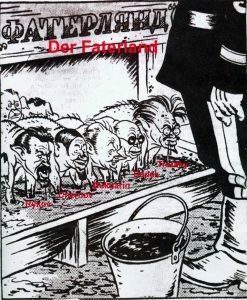 Social democrats in particular were labeled “social fascists” with the result that in Germany the left was badly divided in its opposition to the rise of Nazism. 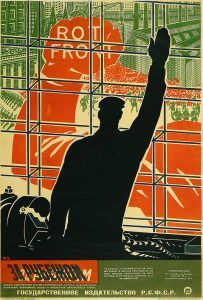 For German Communists, the appointment of Hitler as chancellor in January 1933 seemed to bring the proletarian revolution closer by disabusing the masses of democratic illusions. Ignoring a few dissenting voices within its ranks, the Comintern persisted with its disastrous line throughout 1933 and 1934. 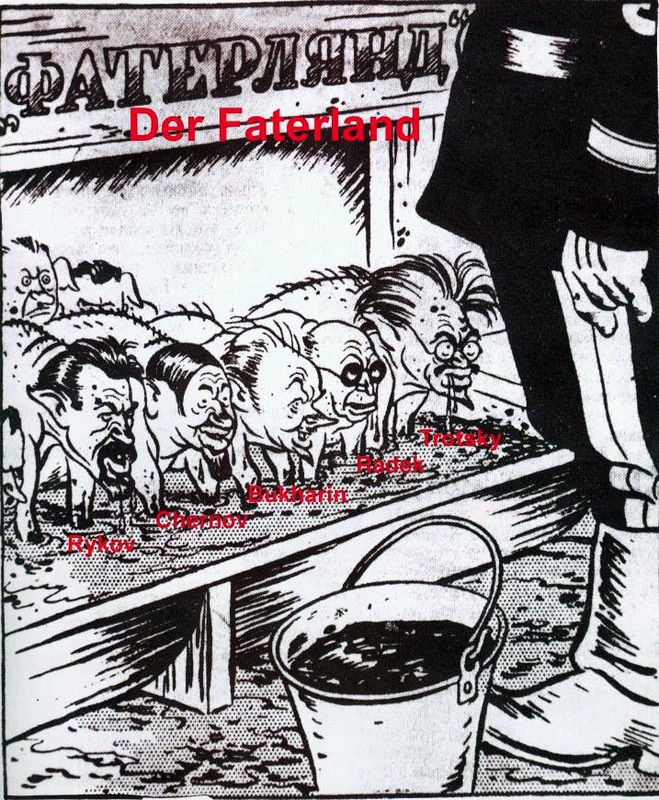 However, the Nazi state’s increasing aggressiveness in international affairs did result in a shift in Soviet foreign policy. This, as articulated and pursued by Maksim Litvinov, the Commissar of Foreign Affairs, was towards obtaining agreements among nations to act in concert against aggressors, a policy known as collective security. The fruits of the new policy were Soviet entry into the League of Nations in 1934 and treaties with France and Czechoslovakia in 1935 promising mutual assistance in the event of foreign aggression. 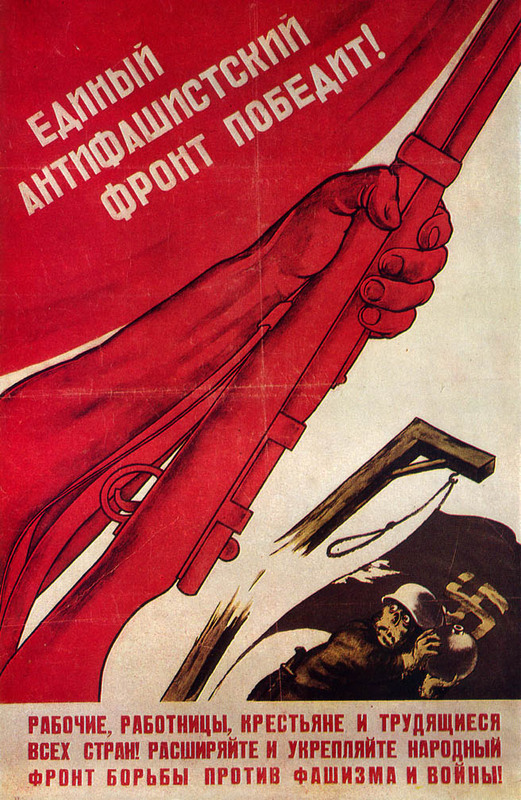 Finally, in July 1935 the Comintern at its seventh (and last) congress formally abandoned its militant sectarian strategy in favor of pursuing the establishment of popular fronts of all progressive forces against fascism. 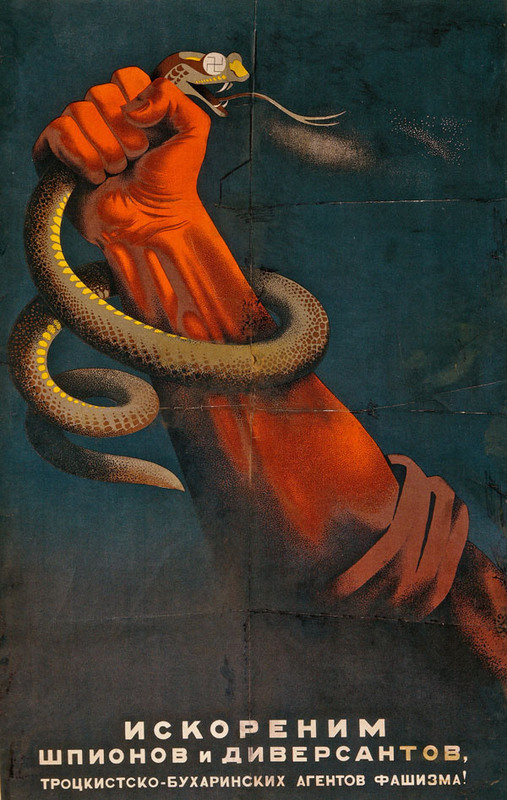 Communist parties thereupon assumed the mantle of patriotism, entered into national electoral alliances with their socialist counterparts, and in 1936 were part of victorious Popular Front coalitions in both France and Spain. Spain, however, was soon plunged into civil war as military officers under General Francisco Franco rebelled against the republic and were aided in their rebellion by arms and troops from Italy and Germany. 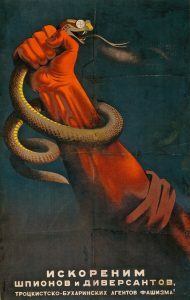 For communists and leftist intellectuals, the fight against fascism in Spain was a cause celebre. Some forty thousand volunteers from throughout the world were organized into International Brigades. The Soviet Union dispatched advisors and arms, but wary of antagonizing the British and French governments, it instructed Communists in Spain to shore up the “bourgeois republic” and oppose the anarchists and Trotskyites who sought to turn the civil war into revolution. These splits on the left and the failure of the western democracies to support the republic facilitated the triumph of Franco’s forces which was complete by early 1939. Just as the Spanish Civil War illustrated the ineffectualness of the Popular Front, so the Munich Pact of September 1938 — in which Britain and France acquiesced in the Nazis’ absorption of Czech territory — demonstrated the failure of the policy of collective security. 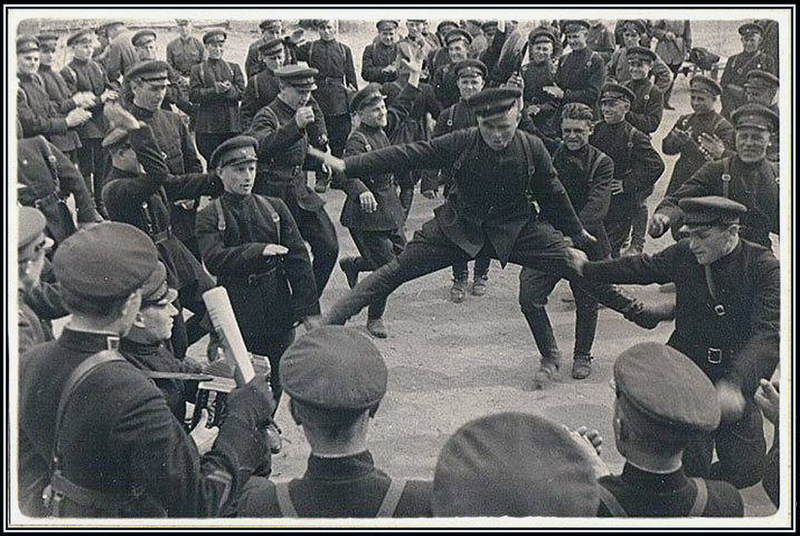 The ground was thereby prepared for a rapprochement between the Soviet Union and Nazi Germany. 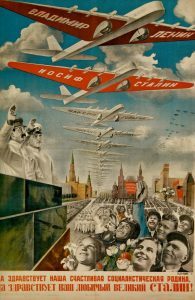 The capital city of both the RSFSR and the USSR, Moscow also served under Stalin as a beacon for world socialism. But Moscow was a nearly 800-year old city, with dozens of churches and residential structures dating from the sixteenth and seventeenth centuries, many narrow twisting lanes, and in a preponderance of wooden, brick, and stone buildings from the late nineteenth and early twentieth centuries. 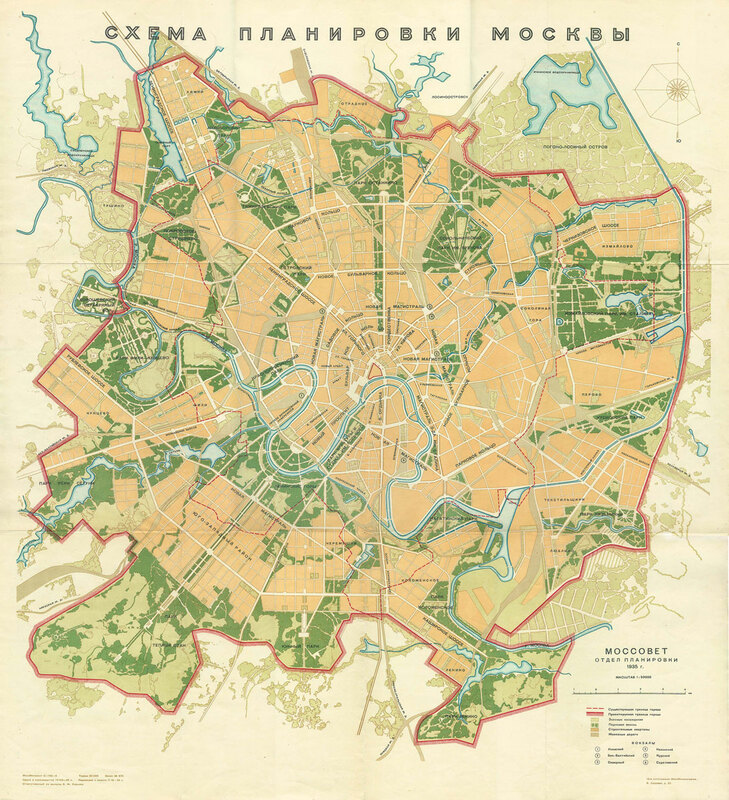 The “Master Plan for the Reconstruction of the City of Moscow,” devised by a commission under Lazar Kaganovich and co-signed by Stalin and Viacheslav Molotov on July 10, 1935, was intended as an “offensive against the old Moscow” that would utterly transform the city. Four years in the making, the plan called for the expansion of the city’s area from 285 to 600 square kilometers that would take in mostly farmland to the south and west beyond the Lenin (a.k.a. Sparrow) Hills. It involved sixteen major highway projects, the construction of “several monumental buildings of state-wide significance,” and fifteen million square meters of new housing to accommodate a total population of approximately five million. 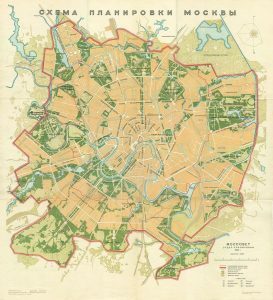 Surrounding the city would be a green belt up to a width of ten kilometers. 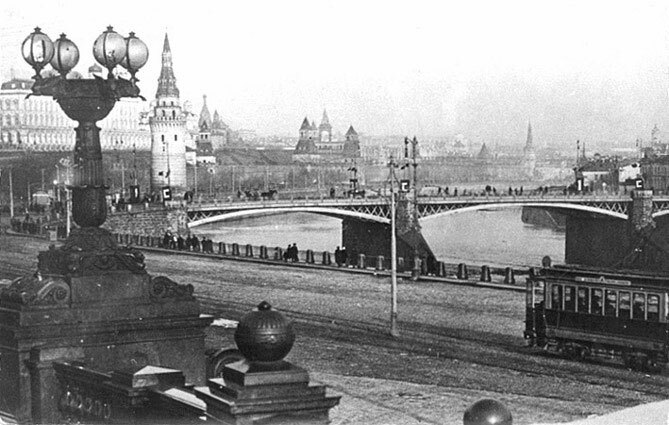 Even while the master plan was being drawn up, old Moscow was giving way to the new. One of the showpieces of the new Moscow was to be the Moscow Metro[politen] which broke ground in March 1932 and went into service on May 14, 1935. A second project begun in the early 1930s was the Moscow-Volga Canal, built by an army of prison laborers numbering 200,000 and opened in July 1937. Yet another project, for a monumental Palace of Soviets capable of hosting meetings of up to 15,000 people, was the subject of an architectural competition held in 1931. Entries were received from 160 Soviet and foreign architects including Walter Gropius and Le Corbusier. 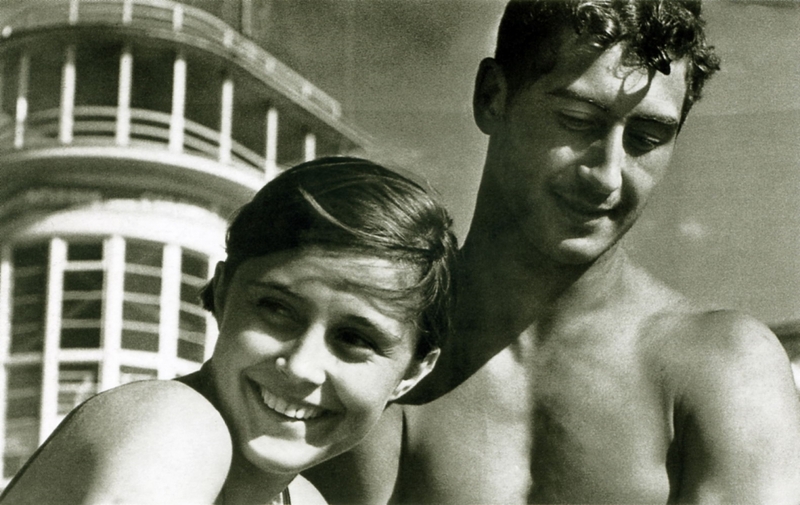 In June 1933, the jury headed by Molotov awarded the project to the Soviet architect, Boris Iofan. His terraced, colonnaded palace was to be the tallest building in the world, soaring eight meters above the recently completed Empire State Building. It was to be crowned with a massive, 90-meter-tall statue of Lenin. The site selected for the colossus was, symbolically enough, the ground on which the Cathedral of Christ the Redeemer had stood before its demolition in 1931. This was one of many churches and religious abbeys destroyed in the frenzy to make over the capital. Work on the Palace of Soviets commenced in 1935 and continued until the Nazi invasion. 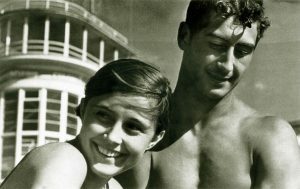 In 1960 a giant outdoor heated swimming pool, the biggest in the Soviet Union (and reputedly, the world), opened on the site. It, in turn, gave way in the 1990s to a replica of the cathedral which was constructed under the auspices of Moscow’s flamboyant mayor, Iurii Luzhkov. Relations between the various Cossack “hosts” and the Soviet state were largely determined by the privileges that the tsarist regime had granted to the Cossacks which over time had become part of Cossacks’ social identity and by Soviet leaders’ ideologically based hostility towards them. 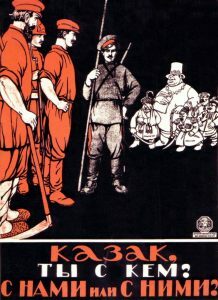 Although some Cossacks had fought on the side of the Reds during the civil war (see Isaac Babel’s stories published as Red Cavalry), most vigorously opposed Soviet rule. 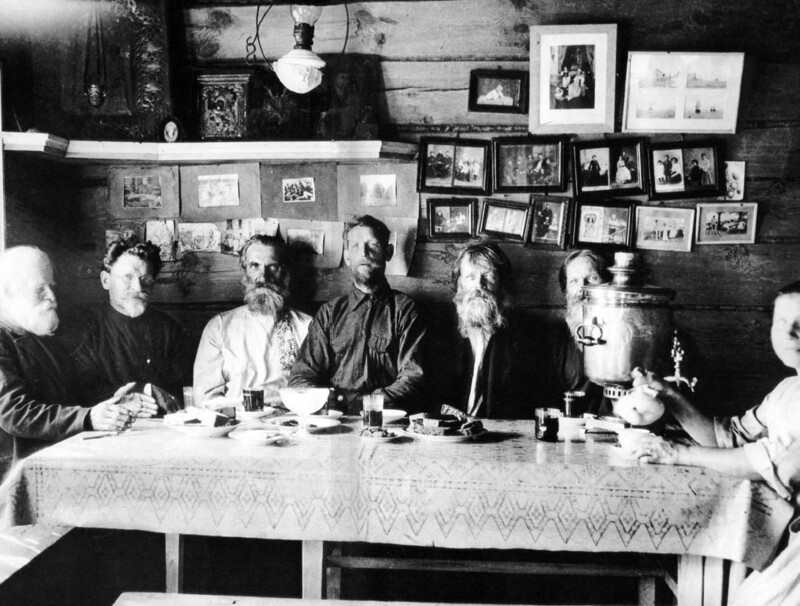 Relations were further complicated after the civil war by the Soviet government’s attempts to eliminate the cultural distinctiveness and economic advantages of the Cossacks and by Cossack resistance to being folded into the social category of peasants. Indeed, at least for the Don Cossacks, nothing could be worse than to be equated with the inogorodnie (“peasant outsiders”). 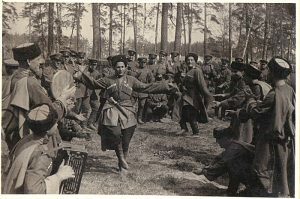 Neither a class nor a nationality by Soviet reckoning, the Cossacks remained a tough nut to crack throughout the 1920s. 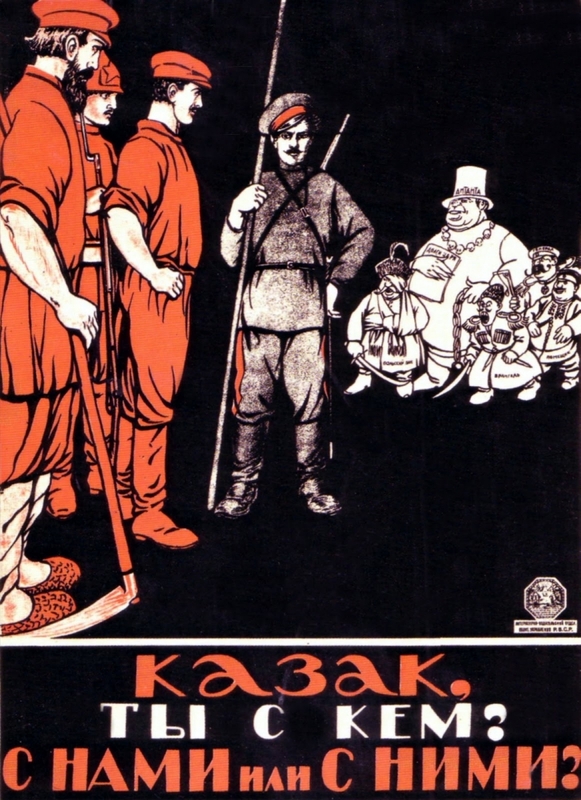 Much remains unclear about the collectivization of Cossack lands and the simultaneous process of dekulakization during the late 1920s and early 1930s. The extraordinary pace of collectivization in the North Caucasus and Lower Volga and the ensuing famine in 1932-33 hint at the devastation to which the Cossacks in those regions were subjected. In any case, with international tensions mounting, the Soviet government decided in 1936 to remove restrictions on Cossacks serving in the Red Army. This decision was accompanied by an order issued by Marshal Voroshilov, the People’s Commissar of Defense, to recreate special Cossack divisions within the army. 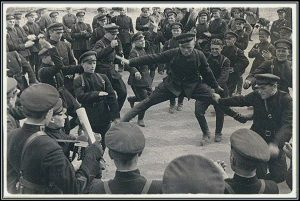 The reaction of Cossacks, as reported by the head of the NKVD in Migulin raion (Rostov-on-Don oblast), was overwhelmingly enthusiastic. 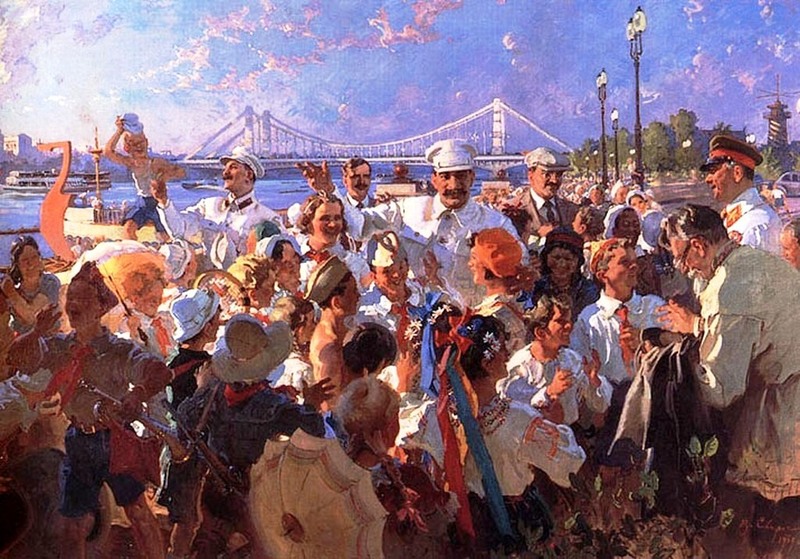 Some, however, regarded the order distrustfully, interpreting it as a sign of weakness and claiming that “nothing will come of this.” Others expressed bitterness at the earlier repression of their “brothers.” Seeking to co-opt the Cossack esprit de corps, Soviet authorities sponsored parades of Cossack cavalry in Rostov, and promoted folklorized versions of Cossack dances on stage and horsemanship in the circus. During the Great Patriotic War, the invading Nazis enjoyed some success in wooing the Cossacks to their side. However, the majority of Cossack soldiers fought bravely if not always effectively against the invader. 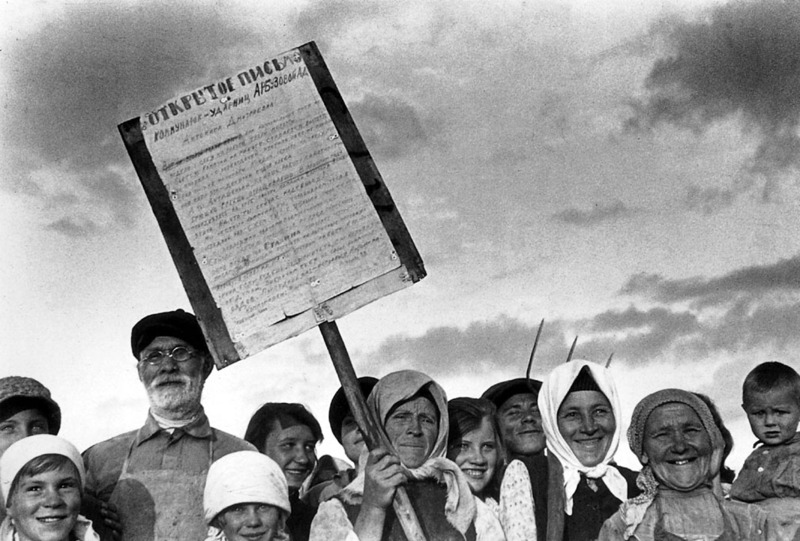 The Second Kolkhoz Charter effectively entrenched the collective farm system of agriculture. It was issued as an exemplary or model document in February 1935, replacing the hastily issued version of March 1930 that had become outdated as a result of the subsequent evolution of collective farms. Drafted by the Central Committee’s Agricultural Department, it was distributed to delegates to the Second All-Union Congress of Kolkhoz Shock Workers which was held in Moscow. The Congress was attended by 1,433 delegates among whom approximately one-quarter were kolkhoz chairmen and another quarter were brigade leaders. The remainder consisted of rank-and-file collective farmers who had been selected supposedly on the basis of their production achievements. 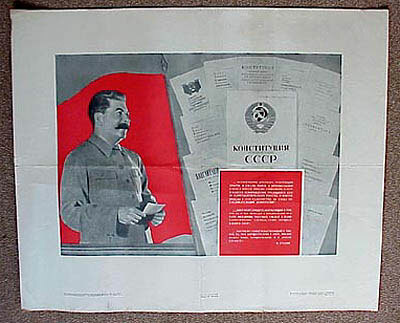 The final version of the charter was produced by an editorial commission of 170 people including Stalin and the new Commissar of Agriculture, Mikhail Chernov, who chaired its sessions. 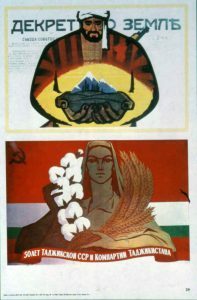 Among the issues debated in the editorial commission and at the congress were the size of garden (“private”) plots for kolkhoz households, maternity benefits for kolkhoz women, conditions for admission to and expulsion from kolkhozes, and the right of expropriated kulaks to join collective farms. On each of these, the party leadership proved to be more conciliatory towards the bulk of the peasantry than did the shock worker activists. 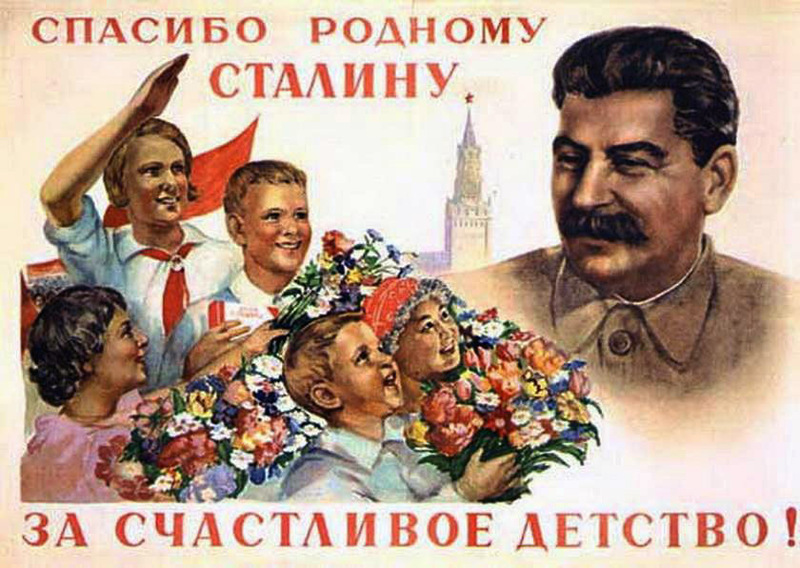 Stalin, for example, reportedly advocated expanding the size of private plots to at least half a hectare and granting two months of maternity leave at half the average earnings. 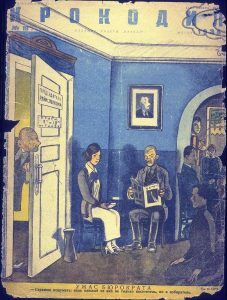 Thus, as was the case with his “Dizzy with Success” article of March 1930, he appeared to distance himself from local activists in the name of accommodating ordinary peasants’ needs. 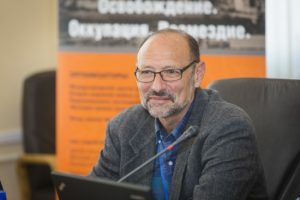 The Second Kolkhoz Charter was confirmed by Sovnarkom and thereafter served as a basis for individual kolkhoz charters which were to be registered by raion executive committees. 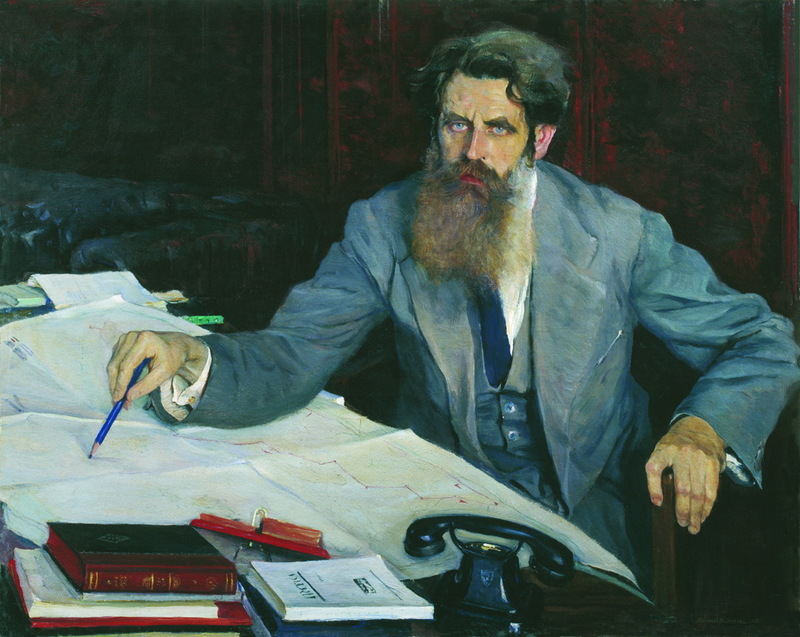 The tasks of determining which kolkhoz lands would be set aside for private plots, allocating the use of kolkhoz horses for personal needs, and adjudicating requirements of kolkhoz membership presented local authorities with formidable challenges. They remained sources of contention within collective farms for many years to come. 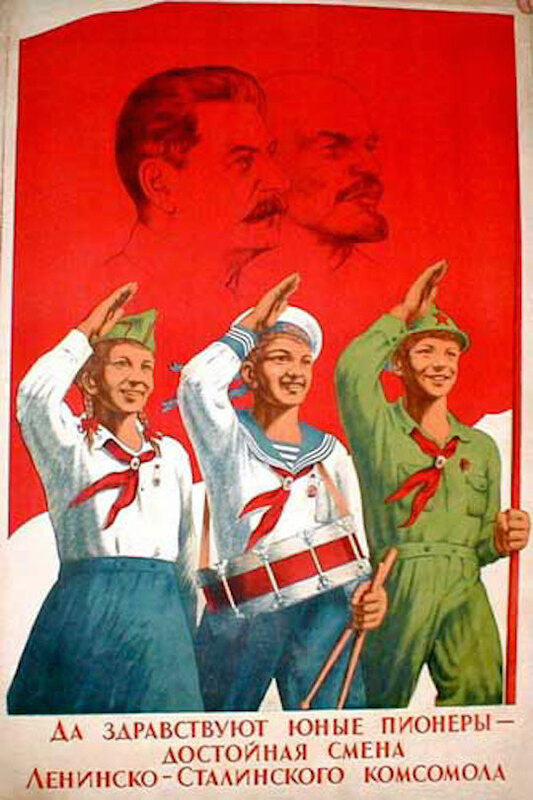 Thus ultimately, collectivization represented only a partial victory for the state over the peasantry. True, it did bring peasants under the administrative control of the state and, through the machine-tractor stations, made them technologically dependent. But peasant resistance extracted certain concessions. 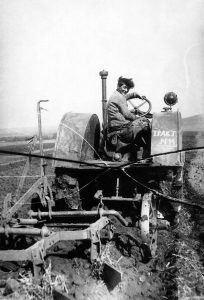 In the longer term, a combination of administrative incompetence, under-investment, and peasant alienation led to extremely low levels of productivity and an agricultural sector that, rather than providing resources and capital investment for industrial development, became a net drain on economic growth. 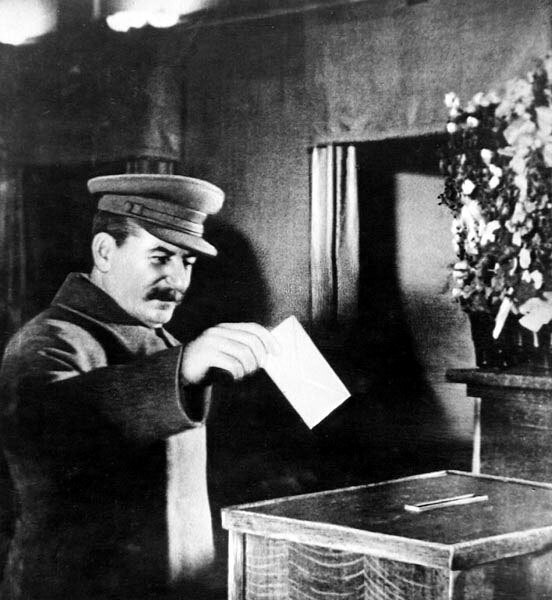 Scarcely thirteen years separated the first federal constitution of the USSR, issued shortly after Lenin’s death in January 1924, from the version that was adopted by the Eighth Extraordinary Congress of Soviets on December 5, 1936 and graced from the moment of its birth with Stalin’s name. 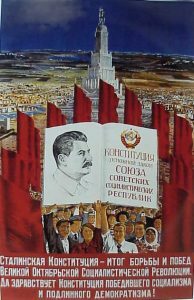 Both the contents of the fundamental laws that comprised the constitution and the elaborate process by which they were brought into being suggest that the 1936 constitution was designed to consolidate the principles of the new socialist state and present an attractive image for both domestic and international consumption. In the language of the time, it was a reflection of the “new correlation of class forces” that could permit the universal rights previously denied to former exploiters, kulaks, officials of the tsarist regime, and the clergy. All Soviet citizens were now equally protected by the law and entitled to the franchise, the right to hold elective office, and other privileges of Soviet citizenship. 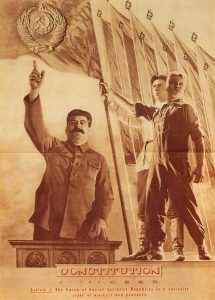 The constitution was the product of a commission appointed by the Seventh All-Union Congress of Soviets in February 1935. 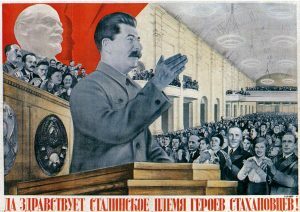 Chaired by Stalin, the commission consisted of thirty-one members each of whom participated in one or more of twelve sub-commissions. After a year’s work, the constitutional commission came up with a draft which was submitted for national discussion. The official figures on the extent of this discussion are mind-boggling: 623,334 meetings held, over forty-two million people attending them, and 169,739 proposals, comments, and prospective amendments. The impression of a public actively engaged in studying and debating the draft is somewhat belied by reports of people being compelled to attend meetings, as well as of the party’s central committee having decided beforehand to approve the draft “in the main.” Still, there is no doubt that the discussion of the constitution provided a rare opportunity in the Stalinist era for the citizenry to air its views on matters of both state and personal importance and that many availed themselves of it. The articles that attracted the greatest attention in discussions and proposed amendments concerned the rights of personal property and inheritance, the civic equality accorded to independent farmers, and the proclaimed freedom of conscience that enabled religious believers to stand for public office. Many who commented on these provisions were opposed to them while others proposed amendments inscribing the right to travel abroad, abolishing the death penalty, permitting the establishment of multiple parties, and so forth. The constitution did not prevent Soviet authorities from carrying out a wide range of arbitrary actions and abuses, including the Great Terror. But it is not insignificant that over succeeding decades most protests against the arbitrariness of political power began by invoking the fundamental laws of the constitution. It was better to be a critic than a composer of operas in 1936. Two very different artists were subject to vicious attacks that year that left them frightened and the musical world confused. Dmitrii Shostakovich, the innovative composer, and Demian Bednyi, the pundit, poet and comrade of Lenin, were both accused of violating cultural norms. This year of purges made such accusations life-threatening. 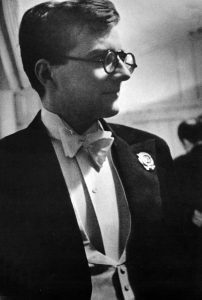 Shostakovich packed a night suitcase in the expectation of arrest, and slept in his apartment entryway, lest his children see his arrest. Though he never was, his nerves never fully recovered. The nerve of the Russian musical world as well was shaken, as artists asked “If they can go, why can’t I?” For the next twenty years, any music capable of arousing controversy was shunned. 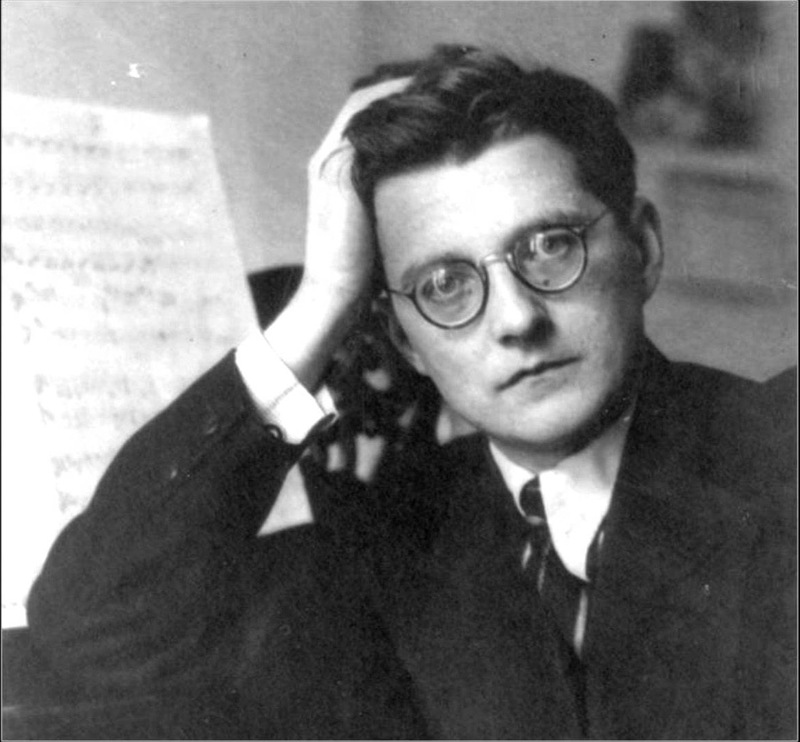 Shostakovich and Bednyi were revolutionaries in very different ways. Bednyi was a Bolshevik long before the Party took power, and saw verse as a scourge and weapon in the battle against reaction. Satire was his forte, and he directed it against tsars, prime ministers, bankers and white generals during the Civil War. His star faded in the subsequent decade and a half, but he could still mount a battle against cultural traditions that infuriated any old Bolshevik. His comic opera, entitled Ancient Heroes (Bogatyri), lampooned the first Russian national heroes, the knights of the oral epics of Kievan Rus’ dating back to the twelfth century, making them into drunken fools. His libretto was set to a medley of Russian classical composers, first and foremost an opera of the same name by Aleksandr, who had meant to praise the tradition, not mock it. Mockery was the method that had gained him fame and revolutionary acclaim; thus he and many others were shocked when Pravda published an unsigned (and thus authoritative) editorial condemning him for, of all things, disparaging the role of Christianity in Russian history. He shared the fate of an unlikely comrade, the great composer Dmitrii Shostakovich. Only twenty-nine when attacked in 1936, Shostakovich was already acclaimed for his music, which combined avant-garde influences and strong melodic gifts, classical harmony and the throbbing pulse of jazz. 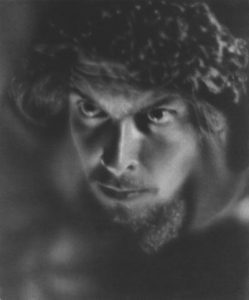 His second opera, Lady Macbeth of Mtsensk, based on a story by Nikolai Leskov, earned admiration and controversy at home and abroad when it debuted in 1934. Western critics took it as an embodiment of the “Communist” style in music; and the Russian music world hailed it as a bold composition. The story of a strong-willed woman trapped in a loveless marriage in nineteenth-century provincial Russia, who comes to ruin when a passionate affair leads to the murder of her husband and his father, the opera thrilled and shocked listeners with its bold dissonance, such as the brazen trombone slide as the moment of consummating the liaison. 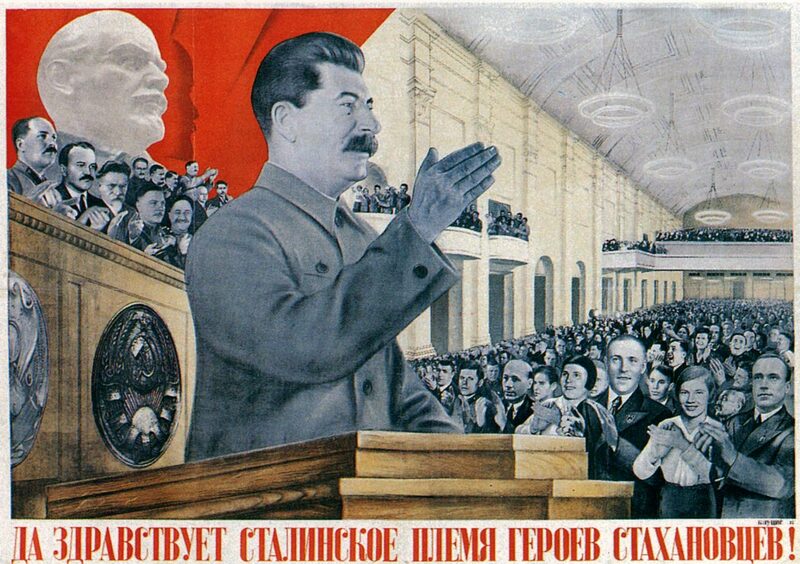 Some prudish listeners abandoned the performance at such moments, but none so ominous as Stalin himself, who walked out of a performance on January 26. 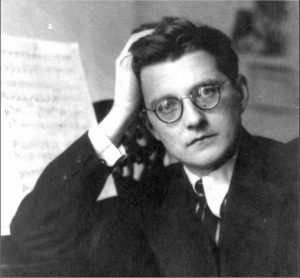 Two days later, the editorial, entitled “Chaos instead of Music” appeared, castigating Shostakovich. “The singing on the stage is replaced by shrieks. If the composer chances to come upon the path of a clear and simple melody, he throws himself back into a wilderness of musical chaos – in places becoming cacophony.” Musical modernism was equated with perversion, and disappeared from the stage for many years. 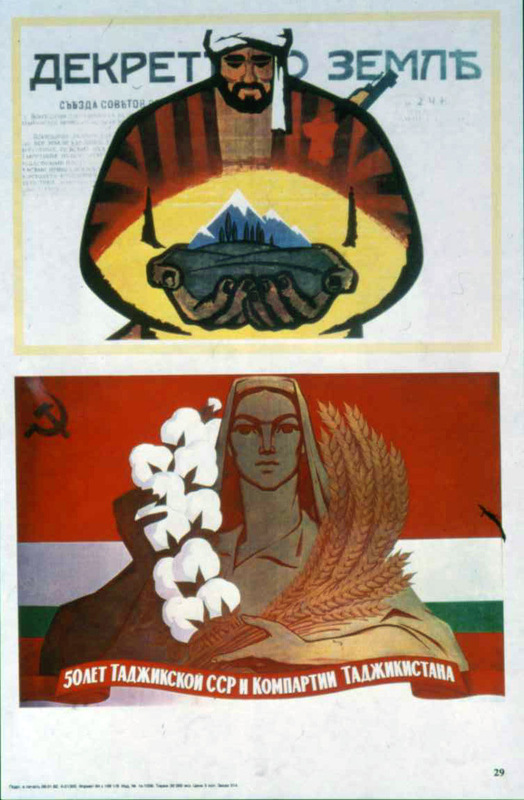 Right: Long Live Stakhanovites!, by Gustav Klucis (1936) / From Art and Power: Europe under the Dictators, 1930-1945, by Dawn Ades, et.al. 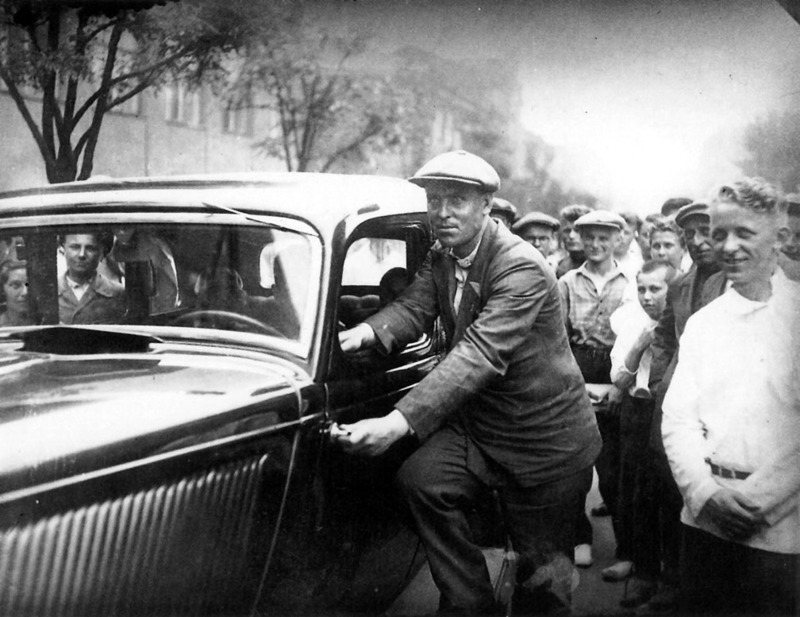 On August 31, 1935, Aleksei Stakhanov, a thirty-year-old miner working at the Central Irmino Mine in the Donets Basin, hewed 102 tons of coal during his six-hour shift. This amount represented fourteen times his quota, and within a few days of the feat was hailed by Pravda as a world record. 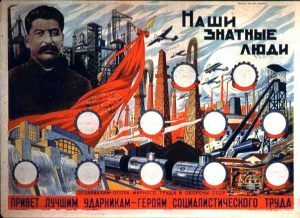 Anxious to celebrate and reward individuals’ achievements in production that could serve as stimuli to other workers, the party launched the Stakhanovite movement. The title of Stakhanovite, conferred on workers and peasants who set production records or otherwise demonstrated mastery of their assigned tasks, quickly superceded that of shock worker. 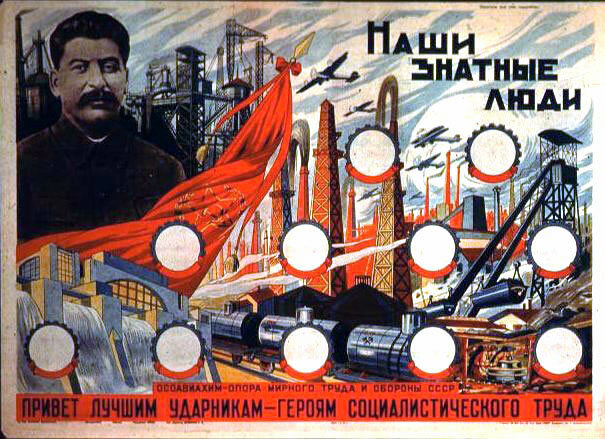 Day by day throughout the autumn of 1935, the campaign intensified, culminating in an All-Union Conference of Stakhanovites in industry and transportation which met in the Kremlin in late November. At the conference, outstanding Stakhanovites mounted the podium to recount how, defying their quotas and often the skepticism of their workmates and bosses, they applied new techniques of production to achieve stupendous results. 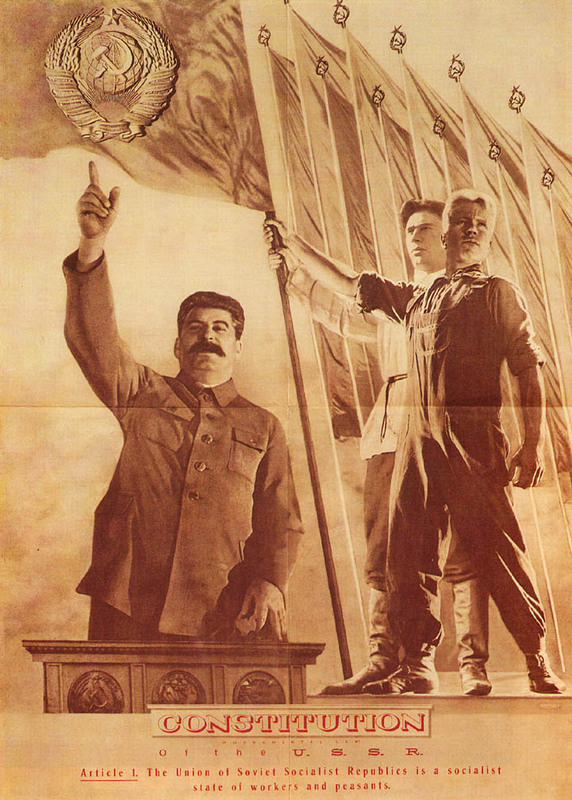 They called for the general adoption of these techniques via socialist competition and, to bursts of applause, thanked Comrade Stalin for, as Stakhanov put it, “the happy life of our country, the happiness and glory of our magnificent fatherland.” Many referred to their increased earnings, which, thanks to the progressive piece-rate system according to which output above the norm was remunerated at higher rates of pay, reached dizzying heights. Some indicated what sort of consumer goods they would buy with their earnings. Stalin captured the upbeat mood of the conference when, by way of explaining how such records were only possible in the “land of socialism,” he uttered the phrase, “Life has become better, and happier too.” Widely disseminated, and even set to song, Stalin’s words served as the motto of the movement. The Stakhanovite movement thus encompassed lessons not only about how to work but how to live. In addition to providing a model for success on the shop floor, it conjured up images of the good life. Many of the same qualities Stakhanovites were supposed to exhibit in the one sphere — cleanliness, neatness, preparedness, and a keenness for learning — were applicable to the other. 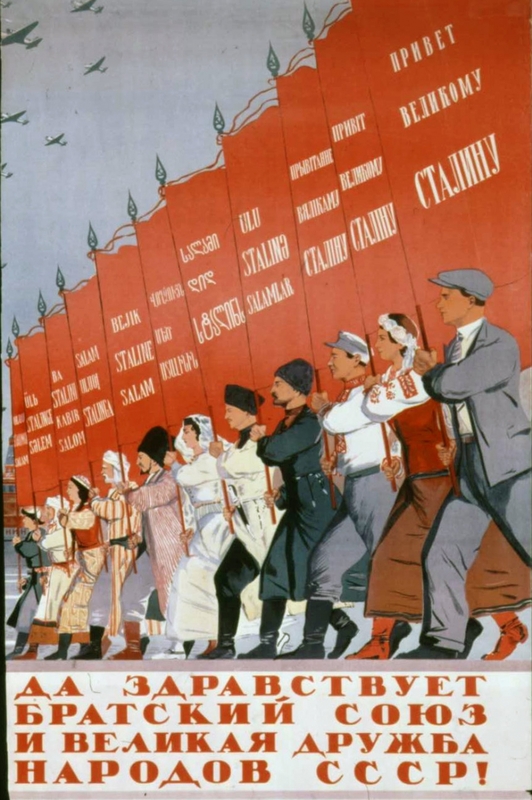 These qualities were associated with kultur’nost’ (“culturedness”), the acquisition of which marked the individual as a New Soviet Man or Woman. Advertisements for perfume in the journal Stakhanovets, articles about Stakhanovites on shopping sprees, photographs of Stakhanovites sharing their happiness with their families, newsreels showing them driving new automobiles — presented to them as gifts — and moving into comfortable apartments all symbolized kultur’nost’. 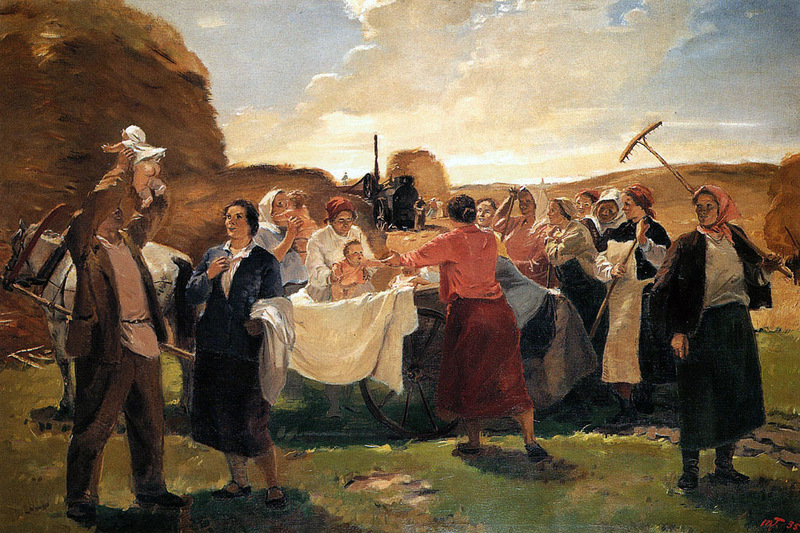 Wives of male Stakhanovites had an important part to play in the movement as helpmates preparing nutritious meals, keeping their apartments clean and comfortable, and otherwise creating a cultured environment in the home so that their husbands were well rested and eager to work with great energy. It was also important to demonstrate that Stakhanovites were admired by their comrades and considered worthy of holding public office. In a broader sense, Stakhanovites represented fitting subjects for stories that contrasted the harsh, oppressive past (either pre-revolutionary or, in the case of peasants’ stories, pre-collectivization) with the prosperous present and the even-more-prosperous and happy future. 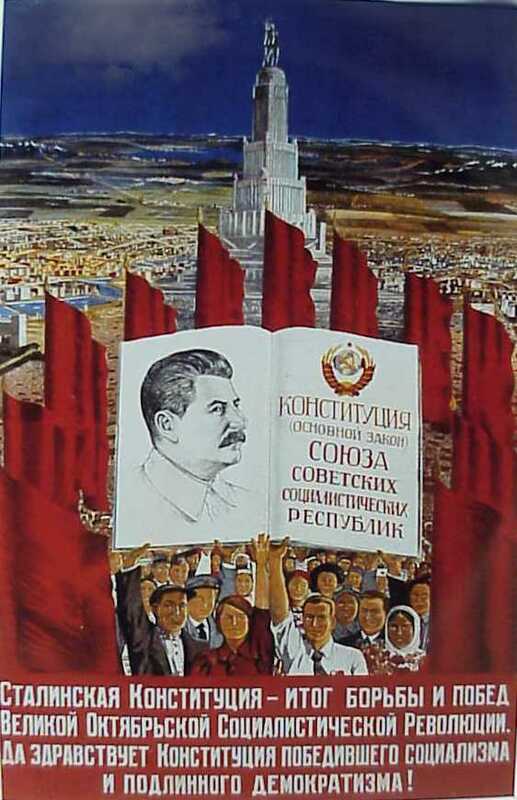 Stakhanovites (or ghost-writers) often constructed such narratives as testimonials to Stalin’s wise (“genial”) leadership and the achievements of Soviet socialism. Notwithstanding the enormous publicity surrounding Stakhanovites and their achievements, they were not necessarily popular. Even before the raising of output norms in early 1936, workers who had not been favored with the best conditions and consequently struggled to fulfill their norms expressed resentment of Stakhanovites by verbally and even physically abusing them. Foremen and engineers, only too well aware that “recordmania” and the provision of special conditions for Stakhanovites created disruptions in production and bottlenecks in supplies, also on occasion “sabotaged” the movement. At least that was the accusation made against many who often served as scapegoats for the failure of the Stakhanovite movement to fulfill its promise of unleashing the productive forces of the country. Nevertheless, the Stakhanovite movement continued into the war and even enjoyed something of a revival in the years after the war when it was exported to eastern Europe. This entry was posted in History, Russia. Bookmark the permalink.